In a small Italian town not far from Rome, a traveller stood listening to an account of a battle lately fought near by, in which the town had suffered much, yet been forever honored in the eyes of its inhabitants, by having been the headquarters of the Hero of Italy. An inquiry of the traveller's concerning a countryman of whom he was in search, created a sensation at the little inn, and elicited the story of the battle, one incident of which was still the all-absorbing topic with the excited villagers. This was the incident which one of the group related with the dramatic effects of a language composed almost as much of gesture as of words, and an audience as picturesque as could well be conceived. While the fight was raging on the distant plain, a troop of marauding Croats dashed into the town, whose defenders, although outnumbered, contested every inch of ground, while slowly driven back toward the convent, the despoiling of which was the object of the attack. This convent was both hospital and refuge, for there were gathered women and children, the sick, the wounded, and the old. To secure the safety of these rather than of the sacred relics, the Italians were bent on holding the town till the reinforcement for which they had sent could come up. It was a question of time, and every moment brought nearer the destruction of the helpless garrison, trembling behind the convent walls. A brutal massacre was in store for them if no help came; and remembering this the red-shirted Garibaldians fought as if they well deserved their sobriquet of "Scarlet Demons." Help did come, not from below, but from above. Suddenly a cannon thundered royally, and down the narrow street rushed a deathful defiance, carrying disorder and dismay to the assailants, joy and wonder to the nearly exhausted defenders. Wonder, for well they knew the gun had stood silent and unmanned since the retreat of the enemy two days before, and this unexpected answer to their prayers seemed Heaven-sent. Those below looked up as they fought, those above looked down as they feared, and midway between all saw that a single man held the gun. A stalwart figure, bareheaded, stern faced, sinewy armed, fitfully seen through clouds of smoke and flashes of fire, working with a silent energy that seemed almost superhuman to the eyes of the superstitious souls, who believed they saw and heard the convent's patron saint proclaiming their salvation with a mighty voice. This belief inspired the Italians, caused a panic among the Croats, and saved the town. A few rounds turned the scale, the pursued became the pursuers, and when the reinforcement arrived there was little for it to do but join in the rejoicing and salute the brave cannoneer, who proved to be no saint, but a stranger come to watch the battle, and thus opportunely lend his aid. Enthusiastic were the demonstrations; vivas, blessings, tears, handkissing, and invocation of all the saints in the calendar, till it was discovered that the unknown gentleman had a bullet in his breast and was in need of instant help. 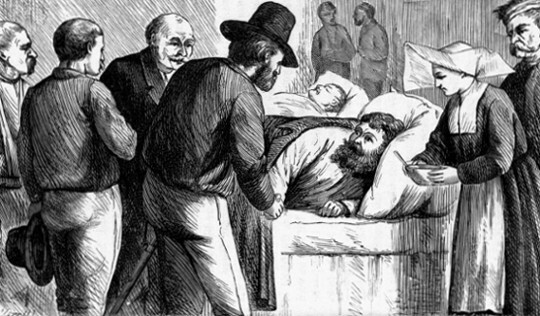 Whereupon the women, clustering about him like bees, bore him away to the wounded ward, where the inmates rose up in their beds to welcome him, and the clamorous crowd were with difficulty persuaded to relinquish him to the priest, the surgeon, and the rest he needed. Nor was this all; the crowning glory of the event to the villagers was the coming of the Chief at nightfall, and the scene about the stranger's bed. Here the narrator glowed with pride, the women in the group began to sob, and the men took off their caps, with black eyes glittering through their tears. "Excellenza, he who had fought for us like a tempest, an angel of doom, lay there beside my cousin Beppo, who was past help and is now in holy Paradise--Speranza was washing the smoke and powder from him, the wound was easy--death of my soul! may he who gave it die unconfessed! See you, I am there, I watch him, the friend of Excellenza, the great still man who smiled but said no word to us. Then comes the Chief,--silenzio, till I finish!--he comes, they have told him, he stays at the bed, he looks down, the fine eye shines, he takes the hand, he says low--'I thank you,'--he lays his cloak,--the gray cloak we know and love so well--over the wounded breast, and so goes on. We cry out, but what does the friend? Behold! he lifts himself, he lays the cloak upon my Beppo, he says in that so broken way of his--'Comrade, the honor is for you who gave your life for him, I give but a single hour.' Beppo saw, heard, comprehended; thanked him with a glance, and rose up to die crying, 'Viva Italia! Viva Garibaldi!'" The cry was caught up by all the listeners in a whirlwind of enthusiastic loyalty, and the stranger joined in it, thrilled with an equal love and honor for the Patriot Soldier, whose name upon Italian lips means liberty. "Where is he now, this friend of mine, so nearly lost, so happily found?" A dozen hands pointed to the convent, a dozen brown faces lighted up, and a dozen eager voices poured out directions, messages, and benedictions in a breath. Ordering his carriage to follow presently, the traveller rapidly climbed the steep road, guided by signs he could not well mistake. The convent gate stood open, and he paused for no permission to enter, for looking through it, down the green vista of an orchard path, he saw his friend and sprang to meet him. "Truant that you are, to desert me for ten days, and only let me find you when you have no need of me." "I always need you, but am not always needed. I went away because the old restlessness came upon me in that dead city Rome. You were happy there, but I scented war, followed and found it by instinct, and have had enough of it. Look at my hands." He laughed as he showed them, still bruised and blackened with the hard usage they had received; nothing else but a paler shade of color from loss of blood, showed that he had passed through any suffering or danger. "Brave hands, I honor them for all their grime. Tell me about it, Adam; show me the wound; describe the scene, I want to hear it in calm English." But Warwick was slow to do so being the hero of the tale, and very brief was the reply Moor got. "I came to watch, but found work ready for me. It is not clear to me even now what I did, nor how I did it. One of my Berserker rages possessed me I fancy; my nerves and muscles seemed made of steel and gutta percha; the smell of powder intoxicated, and the sense of power was grand. The fire, the smoke, the din were all delicious, and I felt like a giant, as I wielded that great weapon, dealing many deaths with a single pair of hands." "The savage in you got the mastery just then; I've seen it, and have often wondered how you managed to control it so well. Now it has had a holiday and made a hero of you." "The savage is better out than in, and any man may be a hero if he will. What have you been doing since I left you poring over pictures in a mouldy palace?" "You think to slip away from the subject, do you? and after facing death at a cannon's breach expect me to be satisfied with an ordinary greeting? I won't have it; I insist upon asking as many questions as I like, hearing about the wound and seeing if it is doing well. Where is it?" Warwick showed it, a little purple spot above his heart. Moor's face grew anxious as he looked, but cleared again as he examined it, for the ball had gone upward and the wholesome flesh was already healing fast. "Too near, Adam, but thank God it was no nearer. A little lower and I might have looked for you in vain." "This heart of mine is a tough organ, bullet-proof, I dare say, though I wear no breastplate." "But this!" Involuntarily Moor's eye asked the question his lips did not utter as he touched a worn and faded case hanging on the broad breast before him. Silently Warwick opened it, showing not Sylvia's face but that of an old woman, rudely drawn in sepia; the brown tints bringing out the marked features as no softer hue could have done, and giving to each line a depth of expression that made the serious countenance singularly lifelike and attractive. "How can I tell? I knew nothing of it till that flock of women fell to kissing these dirty hands of mine; then I was conscious of a stinging pain in my shoulder, and a warm stream trickling down my side. I looked to see what was amiss, whereat the good souls set up a shriek, took possession of me, and for half an hour wept and wailed over me in a frenzy of emotion and good-will that kept me merry in spite of the surgeon's probes and the priest's prayers. The appellations showered upon me would have startled even your ears, accustomed to soft words. Were you ever called 'core of my heart,' 'sun of my soul,' or 'cup of gold'?" "Cannonading suits your spirits excellently; I remember your telling me that you had tried and liked it. But there is to be no more of it, I have other plans for you. Before I mention them tell me of the interview with Garibaldi." "That now is a thing to ask one about; a thing to talk of and take pride in all one's days. I was half asleep and thought myself dreaming till he spoke. A right noble face, Geoffrey--full of thought and power; the look of one born to command others because master of himself. A square strong frame; no decorations, no parade; dressed like his men, yet as much the chief as if he wore a dozen orders on his scarlet shirt." "Where is the cloak? I want to see and touch it; surely you kept it as a relic?" "Not I. Having seen the man, what do I care for the garment that covered him. I keep the hand shake, the 'Grazia, grazia,' for my share. Poor Beppo lies buried in the hero's cloak." "I grudge it to him, every inch of it, for not having seen the man _I_ do desire the garment. Who but you would have done it?" "When can you travel, Adam?" "I was coming back to you to-morrow." "Are you sure it is safe?" "Quite sure; ten days is enough to waste upon a scratch like this." "Come now, I cannot wait till to-morrow." "Very good. Can you stop till I get my hat?" "You don't ask me why I am in such haste." Moor's tone caused Warwick to pause and look at him. Joy, impatience, anxiety, contended with each other in his countenance; and as if unable to tell the cause himself, he put a little paper into the other's hand. Only three words were contained in it, but they caused Warwick's face to kindle with all the joy betrayed in that of his friend, none of the impatience nor anxiety. "What can I say to show you my content? The months have seemed very long to you, but now comes the reward. The blessed little letter! so like herself; the slender slip, the delicate handwriting, the three happy words,--'Geoffrey, come home.'" Moor did not speak, but still looked up anxiously, inquiringly; and Warwick answered with a glance he could not doubt. "Have no fears for me. I share the joy as heartily as I shared the sorrow; neither can separate us any more." "Thank heaven for that! But, Adam, may I accept this good gift and be sure I am not robbing you again? You never speak of the past, how is it with you now?" "Quite well and happy; the pain is gone, the peace remains. I would not have it otherwise. Six months have cured the selfishness of love, and left the satisfaction which nothing can change or take away." "But Sylvia, what of her, Adam?" "Henceforth, Sylvia and Ottila are only fair illustrations of the two extremes of love. I am glad to have known both; each has helped me, and each will be remembered while I live. But having gained the experience I can relinquish the unconscious bestowers of it, if it is not best to keep them. Believe that I do this without regret, and freely enjoy the happiness that comes to you." "I will, but not as I once should; for though I feel that you need neither sympathy nor pity, still, I seem to take so much and leave you nothing." "You leave me myself, better and humbler than before. In the fierce half hour I lived not long ago, I think a great and needful change was wrought in me. All lives are full of such, coming when least looked for, working out the end through unexpected means. The restless, domineering devil that haunted me was cast out then; and during the quiet time that followed a new spirit entered in and took possession." "I cannot tell, yet I welcome it. This peaceful mood may not last perhaps, but it brings me that rare moment--pity that it is so rare, and but a moment--when we seem to see temptation at our feet; when we are conscious of a willingness to leave all in God's hand, ready for whatever He may send; feeling that whether it be suffering or joy we shall see the Giver in the gift, and when He calls can answer cheerfully 'Lord here am I.'" "Tell me your plans, 'my cup of gold,' and let me lend a hand toward filling you brimful of happiness. You are going home?" "Yes; you came for me, I stay for you, and Sylvia waits for both." "She says nothing of me in this short, sweet note of hers;" and Warwick smoothed it carefully in his large hand, eyeing it as if he wished there were some little word for him. "True, but in the few letters she has written there always comes a message to you, though you never write a line; nor would you go to her now had she sent for you alone; she knew that, and sends for me, sure that you will follow." "Being a woman she cannot quite forgive me for loving her too well to make her miserable. Dear soul, she will never know how much it cost me, but I knew that my only safety lay in flight. Tell her so a long while hence." "You shall do it yourself, for you are coming home with me." "All you ever did; walk up and down the face of the earth, waxing in power and virtue, and coming often to us when we get fairly back into our former ways, for you are still the house friend." "I was wondering, as I walked here, what my next summons would be, when lo, you came. Go on, I'll follow you; one could hardly have a better guide." "You are sure you are able, Adam?" "Shall I uproot a tree or fling you over the wall to convince you, you motherly body? I am nearly whole again, and a breath of sea air will complete the cure. Let me cover my head, say farewell to the good Sisters, and I shall be glad to slip away without further demonstrations from the volcanoes below there." Laying one hand on the low wall, Warwick vaulted over with a backward glance at Moor, who followed to the gateway, there to wait till the adieux were over. Very brief they were, and presently Warwick reappeared, evidently touched yet ill-pleased at something, for he both smiled and frowned as he paused on the threshold as if loth to go. A little white goat came skipping from the orchard, and seeing the stranger took refuge at Warwick's knee. The act of the creature seemed to suggest a thought to the man. Pulling off the gay handkerchief some grateful woman had knotted round his neck, he fastened it about the goat's, having secured something in one end, then rose as if content. "What are you doing?" called Moor, wondering at this arrangement. "Widening the narrow entrance into heaven set apart for rich men unless they leave their substance behind, as I am trying to do. The kind creatures cannot refuse it now; so trot away to your mistress, little Nanna, and tell no tales as you go." As the goat went tapping up the steps a stir within announced the dreaded demonstration. Warwick did not seem to hear it; he stood looking far across the trampled plain and ruined town toward the mountains shining white against the deep Italian sky. A rapt, far-reaching look, as if he saw beyond the purple wall, and seeing forgot the present in some vision of the future. "Come, Adam! I am waiting." A fortnight later in that dark hour before the dawn, with a murky sky above them, a hungry sea below them, the two stood together the last to leave a sinking ship. "Room for one more, choose quick!" shouted a hoarse voice from the boat tossing underneath, freighted to the water's edge with trembling lives. "Go, Geoffrey, Sylvia is waiting." "But you are exhausted; I can bear a rough hour better than yourself, and morning will bring help." "It may not. Go, I am the lesser loss." "What folly! I will force you to it; steady there, he is coming." "Push off, I am _not_ coming." In times like that, few pause for pity or persuasion; the instinct of self-preservation rules supreme, and each is for himself, except those in whom love of another is stronger than love of life. Even while the friends generously contended the boat was swept away, and they were left alone in the deserted ship, swiftly making its last voyage downward. Spent with a day of intense excitement, and sick with hope deferred, Moor leaned on Warwick, feeling that it was adding bitterness to death to die in sight of shore. But Warwick never knew despair; passive submission was not in his power while anything remained to do or dare, and even then he did not cease to hope. It was certain death to linger there; other boats less heavily laden had put off before, and might drift across their track; wreckers waiting on the shore might hear and help; at least it were better to die bravely and not "strike sail to a fear." About his waist still hung a fragment of the rope which had lowered more than one baby to its mother's arms; before them the shattered taffrail rose and fell as the waves beat over it. Wrenching a spar away he lashed Moor to it, explaining his purpose as he worked. There was only rope enough for one, and in the darkness Moor believed that Warwick had taken equal precautions for himself. "Now Geoffrey your hand, and when the next wave ebbs let us follow it. If we are parted and you see her first tell her I remembered, and give her this." In the black night with only Heaven to see them the men kissed tenderly as women, then hand in hand sprang out into the sea. Drenched and blinded they struggled up after the first plunge, and struck out for the shore, guided by the thunder of the surf they had listened to for twelve long hours, as it broke against the beach, and brought no help on its receding billows. Soon Warwick was the only one who struggled, for Moor's strength was gone, and he clung half conscious to the spar, tossing from wave to wave, a piteous plaything for the sea. "I see a light!--they must take you in--hold fast, I'll save you for the little wife at home." "Take in this man! he saved you for your wives, save him for his." One resolute will can sway a panic-stricken multitude; it did so then. The boat was rocking in the long swell of the sea; a moment and the coming wave would sweep them far apart. A woman sobbed, and as if moved by one impulse four sturdy arms clutched and drew Moor in. While loosening his friend Warwick had forgotten himself, and the spar was gone. He knew it, but the rest believed that they left the strong man a chance of life equal to their own in that overladen boat. Yet in the memories of all who caught that last glimpse of him there long remained the recollection of a dauntless face floating out into the night, a steady voice calling through the gale, "A good voyage, comrades!" as he turned away to enter port before them. Wide was the sea and pitiless the storm, but neither could dismay the unconquerable spirit of the man who fought against the elements as bravely as if they were adversaries of mortal mould, and might be vanquished in the end. But it was not to be; soon he felt it, accepted it, turned his face upward toward the sky, where one star shone, and when Death whispered "Come!" answered as cheerily as to that other friend, "I am ready." Then with a parting thought for the man he had saved, the woman he had loved, the promise he had kept, a great and tender heart went down into the sea. Sometimes the Sculptor, whose workshop is the world, fuses many metals and casts a noble statue; leaves it for humanity to criticise, and when time has mellowed both beauties and blemishes, removes it to that inner studio, there to be carved in enduring marble. Adam Warwick was such an one; with much alloy and many flaws; but beneath all defects the Master's eye saw the grand lines that were to serve as models for the perfect man, and when the design had passed through all necessary processes,--the mould of clay, the furnace fire, the test of time,--He washed the dust away, and pronounced it ready for the marble.